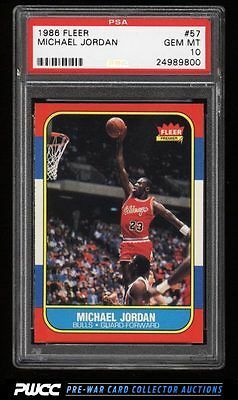 When it comes to investiment caliber sportscards, the '86 Fleer Jordan sets the tone for the hobby. An iconic card with immeasurable popularity and overall demand; simply not enough to go around. A completely pack fresh and stunning example wit hchipelss edges and four near flawless corners. The print and surfaces appear worthy of an even higher grade (should one exist). A world class card, worthy of an equally prominant collection. Part of an absolutely stunning, PSA 10 set break of the iconic '86 Fleer Basketball issue on the auction block this month. Every card displays beautiful centering with exceedingly sharp corners and outstanding surfaces. One of nearly 17,000 cards, lots, and sets up for bid in our 8th Auction of 2016. Click on the link above to view the other PWCC auction lots.